Seventy-two children, 59 girls and 13 boys, 0.1–15.9 (median 1.1) years of age, with acute pyelonephritis (APN) were investigated with the aid of a dimercaptosuccinic acid (DMSA) scan, renal ultrasonography (US) and a desmopressin test within 5 days of admission. Sixty-two children were reinvestigated approximately 2 months later when intravenous urography (IVU) and micturition cysto-urethrography were also performed. During infection, 92% of the children showed changes in the DMSA scan with 69% by US, and the two investigations agreed in 58% of the kidneys. At follow-up, 68% showed changes in the DMSA scan, 47% by US and 48% by IVU. The DMSA scan and IVU agreed in 60% of the kidneys. Twenty-nine percent of the children had vesico-ureteric reflux (VUR). The presence of grade>-3 VUR was associated with greater defects on the DMSA scan during infection, and at follow-up with a higher frequency of persistent changes compared with no VUR (P<0.02 and 0.01, respectively). During infection the size of the defect on the DMSA scan correlated with renal vooume and C-reactive protein and inversely with the glomerular filtration rate, and at follow-up it correlated inversely with the renal concentration capacity. The DMSA scan is a sensitive method for diagnosing and localizing APN in children, and findings on DMSA scan show a weak but significant correlation with routine clinical and radiological parameters. 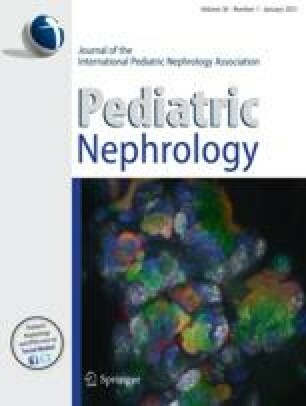 It is suggested that persistent renal damage after APN in children without VUR may be more common than previously assumed.